<br>The critically-acclaimed Sly Cooper series makes its triumphant return this fall with The Sly Collection for the PlayStation3 system (PS3). 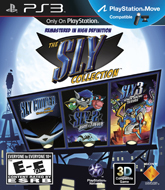 The Sly Collection features three PlayStation2 action-packed classic hits; Sly Cooper and the Thievius Racconus, Sly 2: Band of Thieves and Sly 3: Honor Among Thieves fully remastered in high definition. The Sly Collection sees the mischievous raccoon and his gang of eccentric friends pull off daring heists in this entertaining platformer adventure. Packed full with mini-games and thrilling missions from across the globe, The Sly Collection masterfully blends stealth, thievery, combat, strategy and exploration into one huge world.